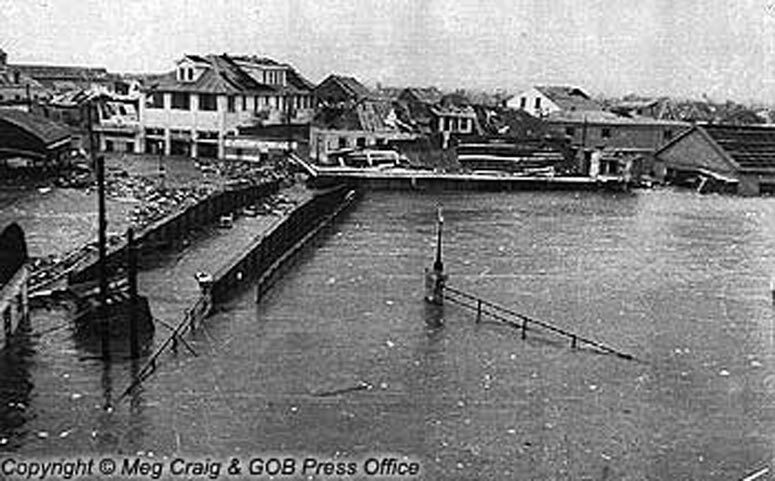 A reminder: Today, Sunday 31 October is the 49th anniversary of Hurricane Hattie, the second-worst storm in modern Belize history, with more than 400 Belizeans, mostly in Belize City, believed to have died. "Our Man in Belize" by Richard Conroy, whatever its faults, has some vivid recollections of the aftermath of Hurricane Hattie. He had only been in British Honduras as a U.S. diplomat for a short time when Hattie hit. (All these were enlarged from smaller images, so are a bit blurry this big. I was 8 years old when Hattie struck Belize City. But I remember it so vividly as if it happened just yesterday. That is one of those types of events in one's life that stays with you for the rest of your life. I will always remember and be thankful to my dad for his absolute bravery during that storm. We lived at #72 New Road on the lower flat. My uncle's family lived on the upper flat. I had been living alone with my dad since I was 5 years old. I can't remember why my younger sister Gloria was staying with us that night. It could have been that there were too many people at my Aunt Hazel's house on Pickstock Street and so my mom decided to send Gloria over to my dad's house. In any event, I remember Gloria and I were sleeping when daddy woke us up and told us we needed to go upstairs because the water was rising. I stepped out of bed to several inches of water on the floor. The winds were howling. Daddy said he would take Gloria upstairs first and come back for me. He did. I remember him having me on his back and telling me to hang on and he struggled to hang on to the railing on the stairs at the back of the kitchen going up to the second floor. It was dark and you couldn't see much except for zink and stuff being blown all over the place. To this day, I just don't know how my daddy did that. He was a very small man, probably about 5'1" at the most, but in my mind, he was a hero that night and was determined that he would save his children at the risk of losing his own life. There was no one else in the upper flat that night because they had all gone to St. Mary's Church for shelter. For the most part of the storm, we were in the kitchen upstairs that ajoined the main house itself. At one point during the time, the kitchen was swaying so badly that you could actually see through the separation in the wooden boards. Daddy told us that we needed to cross over to the main area of the house and once more, he took us on his back one by one to take us across the open crossway to get us into the main area of the house. After the storm was over, I remember standing on the front veranda and looking out at New Road and Pickstock street. Many of the houses between where we were on New Road and where my Aunt Hazel lived on Pickstock Street had been blown away or knocked down and we could see my Aunt's house clearly and we actually waved at each other to let each other know that we were okay. Water must have been 12 to 15 feet high at that time and I saw a lot of boats and helicopters and what looked like C-130's flying over. I had a rough time growing up with daddy. He was an abusive alcoholic. But every time I remember Hurricane Hattie and his selfless acts of love that night, it diminishes all the other hurt and pain I experienced growing up with him. My dad passed away on 15 March 1982. It was not until June of 1992, over 10 years after he died and over three years after I was in recovery myself that I was able to finally forgive him for all that he had done. 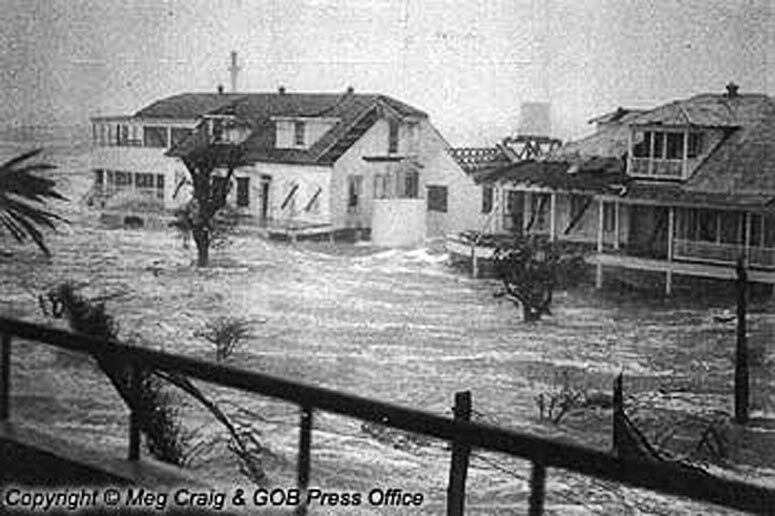 And remembering Hurricane Hattie and what he did that night to save me and my sister helped me to forgive and to heal. There was a book "Cyclone Hattie" I think was the name about Hattie and had a bunch of photos. I remember reading it. I was only four years old during Hurricane Hattie, but I still have some memories: being wrapped in a rain coat and taken to a shelter (will ahve to ask my father where it was), staying with my uncle for a day or two after the storm, and then going to Jamaica on a RAF Hercule aircraft with a plane load of other people, and living there for 9 months while my fahter rebult our home. Before Hattie we had lived on Southern Foreshore near Dickie Gardners place. After we returned from Jamaica, we moved to South Street. I don're recall much about the passage of the storm, except that wherever we were there were a lot of people, and some water on the floors ... and wearing a cousin's dress. My grandmother did remain behind and was able to rescue a lot of my parents' stuff that surnvived the storm but ended up in the hands of looters who alter tried to sell them to her. My dad also had someone try to sell him his fishing rods! The 300 people of Calabash Caye and residents totally disappeared in Hattie. Which makes me curious how the Coast Guard station and tourist places out on Turneffe Atoll did in RICHARD. They had to be close to the EYE or in the Northern Quadrant. Haven´t heard yet of Robinson Point COBIA fish farming operation either. I was out in that area today for a bit. 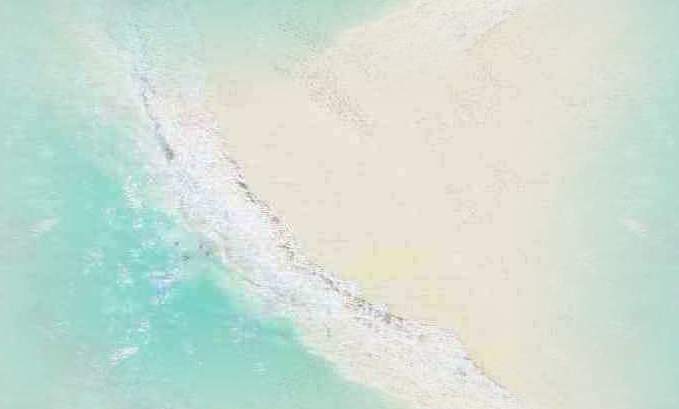 Given the devastation I saw on Spanish Caye, Holmes/Simmonds Caye, Robinson's Point and surrounds I cant image anything COBIA survived. My family's structures on Holmes/Simmonds were a total loss as it was with Greta in 1979...fortunately this time, there was no loss of life on the caye. Foreman's Caye was pretty banged up too. 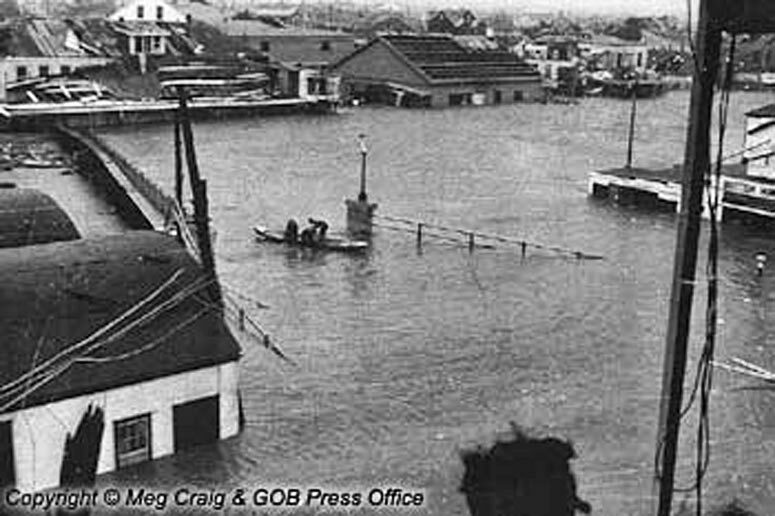 In reminiscing on events tied to the October 31st, 1961 HURRICANE HATTIE, I wish to share an episode in which I played a part in the alleviation of the aftermath of such a devastating cyclone. At 24, I worked a shift as an Air Traffic Controller at Puerto Barrios Airport in 1961. I had returned from Mexico City where I obtained a Diploma as an ATC Officer from the Aeronautics School (CIAAC) in Mexico on an ICAO (International Civil Aviation Organization) Scholarship sponsored by the United Nations. I worked briefly in Mexico and Guatemala City. With no vacancies at Belize Airport (Stanley Field in those years), I was posted in Puerto Barrios. Most ATC Officers at Belize Airport had studied at the same CIAAC Aviation School in Mexico. Puerto Barrios Airport & Military Base was built by the U.S.A. Government during World War II, serving as a strategic alternate Point. Its runway, built with poured concrete, was perhaps the best in Central America at the time. Monday morning of October 31, there was a dead calm in Puerto Barrios, and our Met Officer’s metereological report had zero under wind movement. The tide was way out. A few birds flew lazily above our Tower. There was news that a hurricane was moving in the Caribbean towards our coast. By 3:00 p.m. a brisk wind developed into strong gusts from 20 to 40 knots. By seven pm, hurricane outer winds were lashing past Roatan, and its center heading straight for Belize. By 9:00 p.m., the northern end of Puerto Barrios “El Rastro” was whipped and most thatched houses went down. Part of Hattie’s surge and rain inundated most of Puerto Barrios. My boss, Constatino Taylor (Creole like myself, and the father-in-law of Tony Navarette of Belize, an SJC alumni ) had the morning shift. He got the news from Guate. Guate got it from Toncontin, Tegucigalpa. (Honduras’ Toncontin Airport was the Air-Traffic Control Center for Central America) Belize City was hit at 9:00 p.m. direct by Hurricane Hattie, and the City was UNDER WATER! I froze! I had family in Belize. My sister, Lusilla McNab, and her husband, Eddie McNab of famous Traveller’s Bar, were there. Belize’s Stanley Field Airport was incommunicado, isolated from Belize City. Telephone lines were down, and the British soldiers from Airport Camp were on the double cutting their way through debris, zinc, fallen trees and huge logs strewn across the road in an effort to reach Belize City. I understood afterwards that a Mexican plane, the first to approach Belize after the hurricane, was caught in a turbulence which sent it down. Airline traffic into Belize were cut off, and neither Toncontin nor Guatemala City could get Stanley Field on Area Control frequencies. I was on morning shift the following day, and Guat’s ATC Boss, Carlos Paiz, called me from La Aurora Airport and inquired if I (at Puerto Barrios’ Tower) could contact Stanley Field, using the frequency reserved for Area Control communications. I eagerly switched on, and called Stanley Field. I could barely hear the Control Tower, but I noted the Tower operator was happy to have someone to communicate to. I passed this to Carlos Paiz. Paiz told me Guatemala was getting some airplanes ready to fly to Belize, with emergency food, clothing, medicines, and Red Cross personnel. But they needed to find out the condition of the landing strip. I passed this message to Stanley’s tower. I learnt that even though the water was receding, the runway was still some eighteen inches under water. Luckily there were not much debris on it. I then passed this message to Paiz at La Aurora Airport in Guatemala. The planes (DC-3 and C-46) were to take off from Guatemala City’s La Aurora, head north-east to Puerto Barrios, then strike due north to Belize’s Stanley Field. The flight would take an hour and forty minutes at least, but they would fly on VFR instead of shooting straight across high mountains and El Peten and have to use IFR. Abnormal weather conditions and Stanley’s now limited communications-system were taken into account. Approach Control was out the question. VFR and the Control Tower were to be in play. When Paiz asked me if there could be less than four inches of water over the runway for the plane to make a landing, I spoke to Stanley Field and while the operator believed so, he was somewhat hesitant. I was eager for the planes to start moving to Belize to help my people, and so I pressed the Operator for an affirmative answer. He said he could not say, but he hoped so. I called Paiz and told him the water was receding, and in any event, the first plane could circle the airport and check out the runway. If unable, they could return to Puerto Barrios, and wait for the all clear signal. Paiz agreed. “Aviateca” from Guatemala did make it to Stanley Field. It was the first airplane to land in Belize with foodstuffs and medicine! Thereafter, the arrangement was for the airplanes to carry food and medicines and on their return they carried the sick and injured from Belize to Guatemala City for medical attention and convalescence. Many Belizeans working in Guatemala at the time, got on these planes going in search of their relatives in Belize. I was active in moving some from Puerto Barrios (including my brother Allan) to get a ride on the planes to Belize. Students from Honduras and Guatemala attending SCA and St John’s also boarded the planes on their return. My wife usually relates a vivid account of that terrible night. She had undergone surgery just two days before, and was in the Belize Hospital. Her brother, John Paulino, was a sergeant in the Police Force in Belize City. He and Father Delaney SJ visited the hospital that 30th evening, advising patients to go over to proper shelters because the hurricane was heading for Belize.. That night, my wife and 20 other patients crammed into a bathroom as the waves pounded the hospital and the wind blew off the Private Ward. Minutes became hours and hours an eternity. When the winds abated, they thought it was early morning when in fact it was 3 p.m. the afternoon, and the water had reached the Hospital’s second story verandah. They then saw Hon. George Price accompanied by some officers, making his way into the Hospital compound. He had a walking stick, and the water reached his knees! She still squirms when she remembers how British soldiers ignited the corpses in the compound by lighting matches in their toenails! It was a terrible ordeal. Motor vessel “Mother B,” plying the Toledo to Belize City waters, doubled its trips along the coast, and even went to Puerto Barrios moving people who were stranded in Belize after the devastation. In the ensuing days, as I visited “La Caribena,” a favourite watering-hole belonging to my cousin John, in Puerto Barrios, I would relate the story to Belizeans there with great pride on my role in convincing Guatemala’s Air Traffic Control Authorities for the airplane to move with immediate help for our people, by establishing an urgent phone-patch between Puerto Barrios Tower, Belize’s and Guatemala’s La Aurora. Two years after, I returned home, but there were no vacancies at Stanley Field. When Civil Aviation wrote me, in 1969, and invited me to fill a vacancy as an ATC Officer at Belize International Airport, I was already in politics. I was one of the first Representatives to sit in the National Assembly in 1971 in the new city of Belmopan, a wise product of Hurricane Hattie. And of course, you know that story.